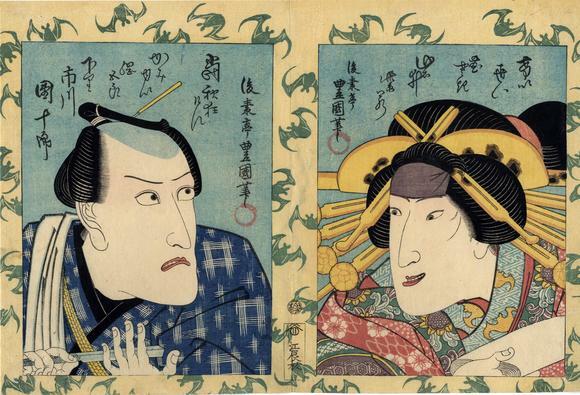 Within a frame decorated with flying bats a superb double bust portrait of the actors Iwai Hanshirō and Ichikawa Danjūrō as a high-ranking oiran with tortoiseshell combs and many hairpins and her client holding a razor. Rare. Notice that the figure on the right is also wearing a fabric decorated with flying bats. There is another print from this series in the Lyon Collection, but with a different publisher's seal. See #691.